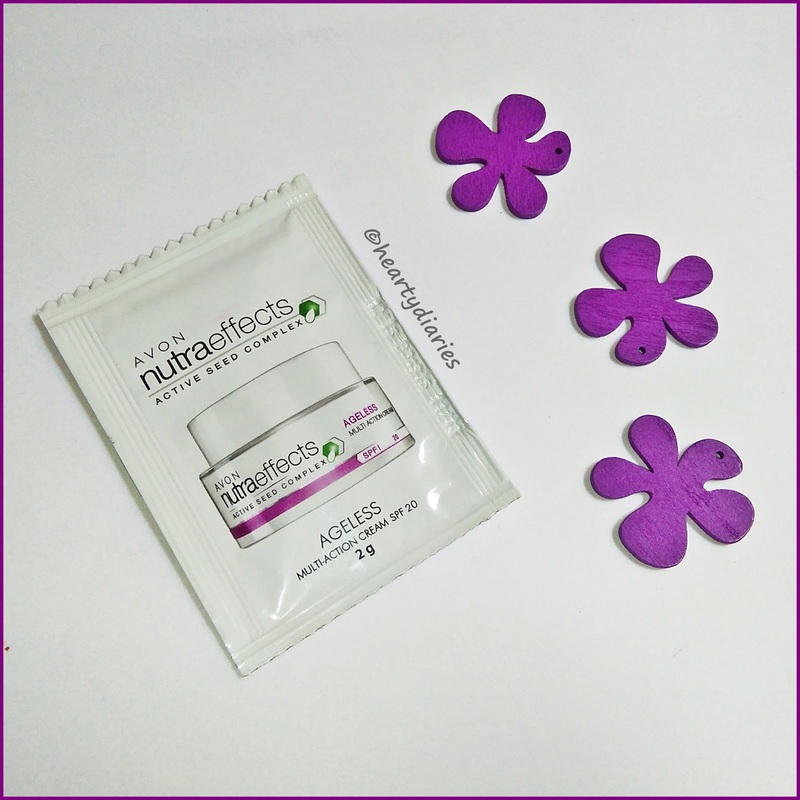 A multi action cream is all a girl would want as it fights all signs of ageing, fine lines, wrinkles, protects skin from harmful sun rays, prevents sagging skin, treat hyper pigmentation, makes the skin hydrated, supple and much more. These days there are so many multi action creams in the market and some are really pricey as well but it is really important to see whether they perform well or not. There are many textures available in these creams (heavy, light, medium, greasy, non greasy, absorbent, non absorbent, matte etc) and so are many skin types and preferences in this world. 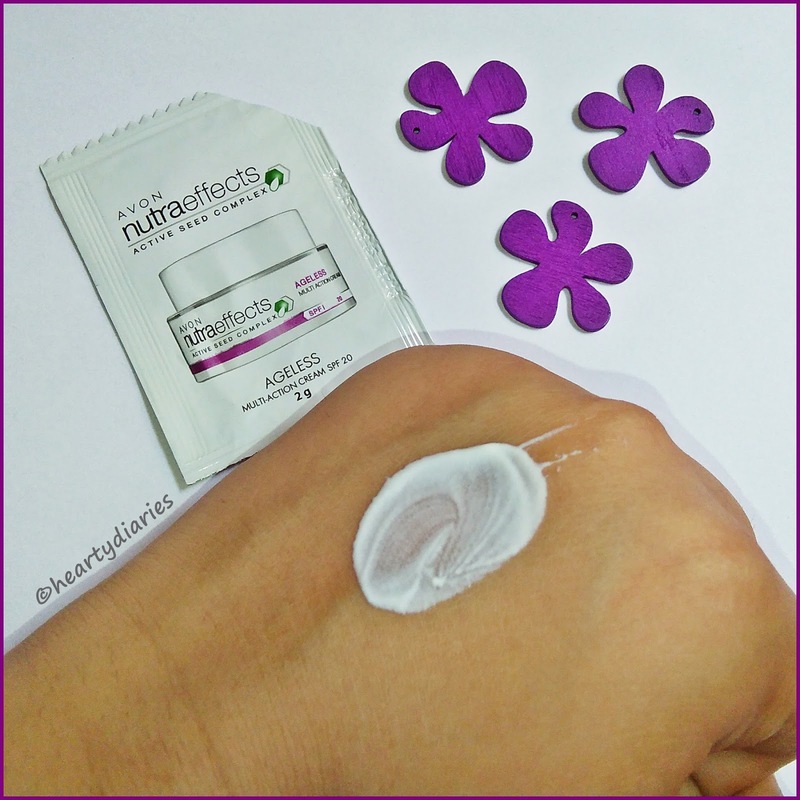 Who wouldn’t love to buy a multi-action cream with sun protection factor, that too 20? 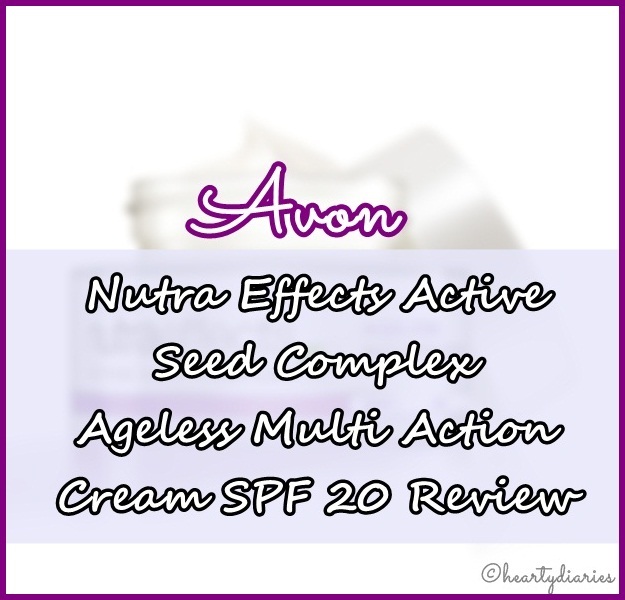 Today I am going to share my review about Avon Nutra Effects Ageless Multi Action Cream SPF 20 for you all based on my sensitive, acne-prone and very oily skin. My review may not be same as other people out there as my skin and products choice is definitely different. What suits me may not suit you and what doesn’t suit me, may suit you. Its all a matter of our skin types and choices. Maybe you would highly agree or disagree with me after reading this review. 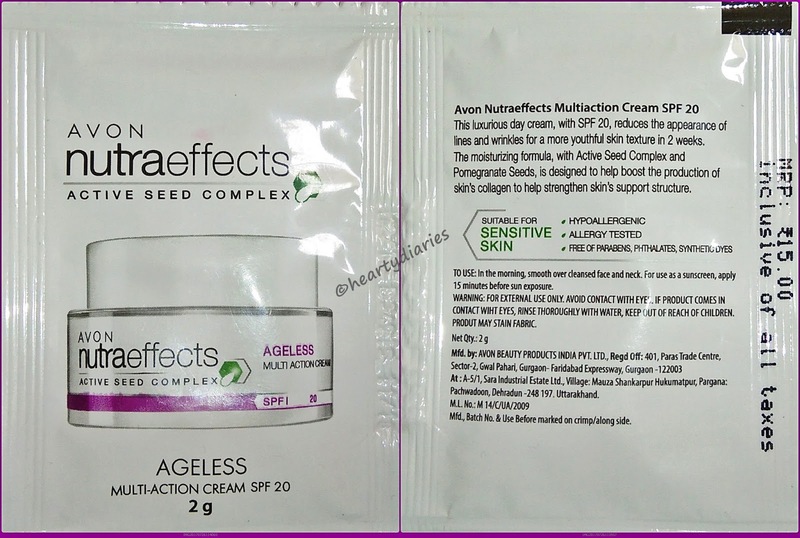 I hope my experience and opinion about this multi-action cream helps you to decide whether you would want to try this product out or not, if you have a similar skin type like me. Also, let me tell you that I am reviewing this product via a 2 gm sample worth Rs. 15 that I bought a while ago from Snapdeal. Without blabbering much, let me just dive into the review. Product Description: This luxurious day cream, with SPF 20, reduces the appearance of lines and wrinkles for a more youthful skin texture in two weeks. The moisturizing formula, with Active Seed Complex and Pomegranate Seeds, is designed to help boost the production of skin’s collagen to help strengthen skin’s support structure. Warnings: For external use only. Avoid contact with eyes. If product comes in contact with eyes, rinse thoroughly with water, keep out of reach of children. Product may stain fabric. Packaging: Even though I am reviewing this product via a sample sachet, it comes in a white tub having a white screw cap. The tub material looks like plastic in the picture but I’m not sure. It also has purple detailing both on the tub and on the sachet. I don’t really like tub packaging because it feels unhygienic to me and I at-least demand for a spatula inside such tubs. Texture and Consistency: This cream has a white, creamy texture and the consistency is very thick. My Experience: After taking a really refreshing shower in the morning, I warmed up a really little amount of this cream in between my fingers so that the ingredients are activated with the heat of my body temperature and it melts into my skin more. I dotted the cream all over my face with my fingertips and massaged in circular motions. 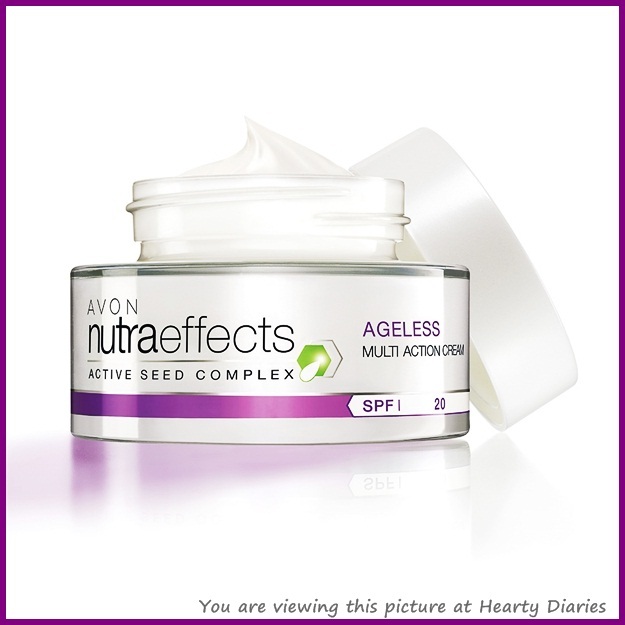 Only a small amount of this product is sufficient to get properly absorbed into the skin and moisturize it well. I was happy with the absorbent property and overall consistency which requires less amount and effort but my expectations lay flat all of a sudden when I realized that the cream is extremely thick, heavy and sticky. It felt so greasy as if it would block my pores and the feeling was really uneasy. I have extremely oily and sensitive skin as mentioned earlier. This cream is friendly towards sensitive skin and didn’t cause any harm or itchiness to me but I cannot let my pores and skin feel so sticky and heavy. This cream is meant for all skin types but I am of the view that people with oily skin would not like it at all as it makes it super oily, sweaty and the shine is just intolerable. 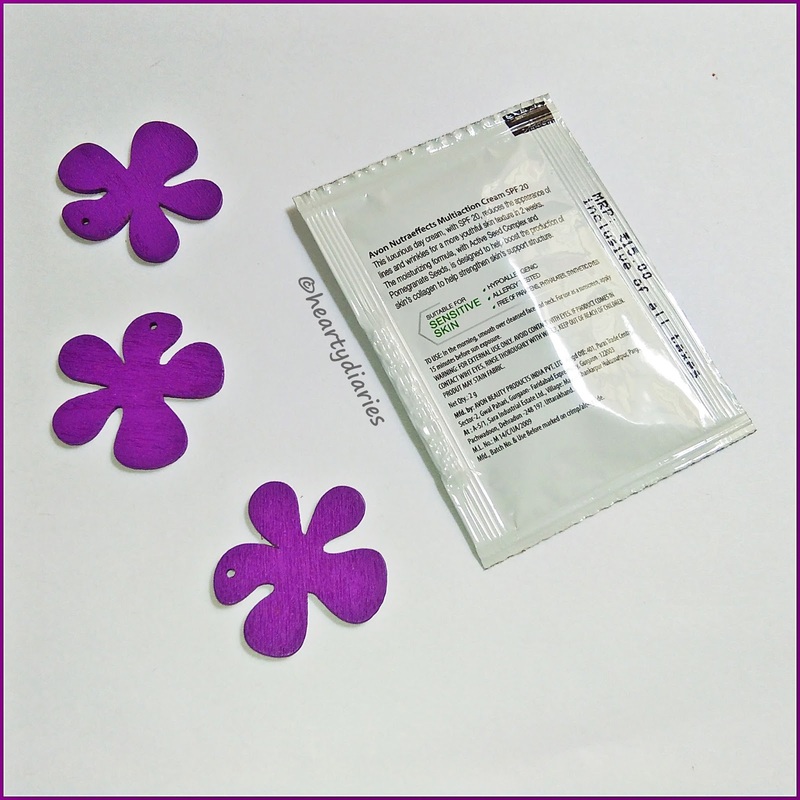 I used almost a quarter amount of coin-sized product received in the sachet by noticing the thick consistency but it went thicker on application. Its highly highly moisturizing which I don’t think I need, that too in summers. May be it can work for me in winters but my skin doesn’t get much dry even in winters too. I love the fact that it is hypoallergenic, allergy tested, contains spf and is free of parabens, phthalates, synthetic dyes etc but I feel like this product is not for me. It may act as a good hand cream for people with extremely dry skin. No. This product is not meant for my skin type, so I’ll never buy it again. The moisturization factor it has, really works well but works too much I guess. I don’t recommend it to people with oily or normal skin. It is extremely thick, heavy and moisturizing due to which I feel it is only good for people with dry skin. If your skin tends to get extremely dry in winters, this can be a good savior though. Final Verdict: I feel that the texture is so thick and heavy which leads to over greasiness and oiliness on the skin. According to me, it is a good daily moisturizer which also has sun protection factor in it but only for people who have extra dry skin. People with normal or oily skin like me, cannot tolerate such a heavy moisturizer. It gets absorbed easily but makes the face look sticky and oily. The shine it gives is something I cannot adjust with. Even though it is suitable for sensitive skin, only people with extra dry skin would actually like it. Thanks fr d review..will skip it.. Thanks a lot Khadija ? oily skin is a real problem ? It feels so uneasy ? Yeah even I thought that… Fortunately it doesn't.. Thanks for stopping by. Hope it works for u..